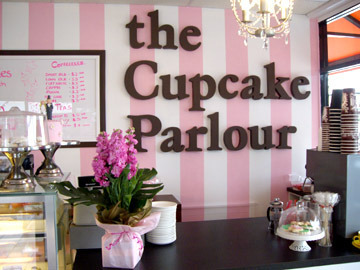 Every aspect of the Cupcake Parlour is to die for and you will not be disapointed. Have you got a sweet tooth and an eye for cute edibles? If so, you won't be able to go past the glorious goodies from The Cupcake Parlour in West End. With over 40 flavours to choose from, you'll have a hard time deciding which flavour you want and then you probably won't want to eat it because it looks so damn good. You can pop into The Cupcake Parlour for a cupcake and a milkshake anytime between 8:00am and 4:30pm from Monday through Saturday or between 9:30am and 2:00pm of a Sunday. If you can't stop at one, The Cupcake Parlour can provide you with a surplus of cupcakes for your next event. Catering for weddings, birthdays, baby showers morning teas and "any occasion imaginable", The Cupcake Parlour is the answer to all your cake dilemmas. The Cupcake Parlour can even make custom cakes following specifications of whatever your heart desires. If you want to know more, visit The Cupcake Parlours website where you can view galleries of all the tasty treats. After all, you're never too old for a cupcake. Why? Because cake is best eaten in cute, decorated cupcake form.